Obituary – Doyle, Robert Emmitt « Perry High School Alumni Association, Inc.
– intends to go immediately into either the United States navy or marines following graduation this spring from Perry high school. Doyle 20 years old, is the son of Mr. and Mrs. George E. Doyle, Jr., of 1022 Fir street. He attended St. Joseph’s academy and Perry high school before entering as a student at PHS. A member of the football team, Bob played right halfback and lettered in the sport for three years. He is active in wrestling and has won a letter for three years in that sport also. In regional wrestling tourneys last year he took third place for 154-pound contenders. President of his homeroom for three years, Bob is captain of the Sons of American Legion and belonged to the student council while in the ninth grade. Robert E. Doyle, 72, of Nampa, Idaho, died Saturday, January 13, 1996, at his home. Graveside funeral services will be conducted at 2:30 p.m. Wednesday, January 17, 1996, at the Middleton Cemetery. Fr. Paul Mathews, S.M., of St. Paul’s Catholic Church will officiate. Friends are asked to meet at the cemetery. Services are under the direction of the Alsip Funeral Chapel, Nampa. Robert E. Doyle was born on February 2, 1923, at Perry, Oklahoma, to George and Verna Hale Doyle. He was reared and educated in Perry. 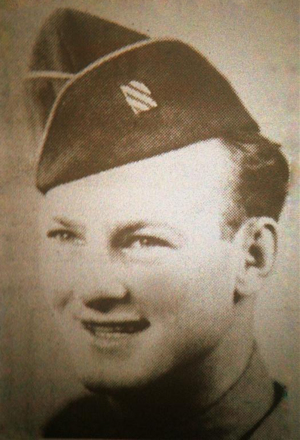 After his schooling, he entered the U.S. Army and served with the 3rd Infantry Division in Germany during WWII. During the War, Robert was awarded 2 Bronze Stars for his courage in leading an entire Company of men through a mine field. He was honorable discharged, and returned to Oklahoma. He married Marion F. Grusso on April 22, 1946, in Perry, Oklahoma. He then attended college in Oklahoma where he obtained his degree in engineering. His work took them to New York, Kansas, Oregon, and in 1968 they came to Caldwell to make their home. He later retired, and in 1984 they moved to Nampa, where they have since resided. Robert was a member of the Catholic Church and a member of the Caldwell B.P.O.E. #1448. He loved to play golf, especially at Purple Sage and Centennial. He also loved to do woodworking in his shop at home. He will be greatly missed by his loving family. Robert is survived by his wife, Marion of Nampa; 3 daughters, Roberta E. “Bobbie” Warner, Portland, Jessica R. Records and her living husband James, Portland, Kellie Lee Doyle, Boise; 1 son, Christopher E. Doyle and his wife Tracy, Middleton; 1 brother, George Doyle, Wichita, Kansas; 2 sisters, Dortha M Saddler, Edmond, Oklahoma, Aloma F. Case, Pahuska, Oklahoma; 7 grandchildren, Wade A. Warner and his wife Denise, Stefeni Warner, Carrie Hageland and her husband, John, Amy Records, Benjamin Records, Jamie Records, Blaze Doyle; 1 great-granddaughter, Madison Warner and several nieces and nephews. He was preceded in death by his parents and 1 brother.